It’s really just a syrup made of a sweet fortified wine… but it actually tastes as fancy as it sounds. (Which is good, or else it I think it’d be something of a letdown.) Still, it’s as easy a sauce as you can make, being only one ingredient, and you can put it in or on anything dessert-like! With such an ingredient, I decided it should be part of a dessert that embodied total, all-out, fanciness. You know, as opposed to halfhearted fanciness. 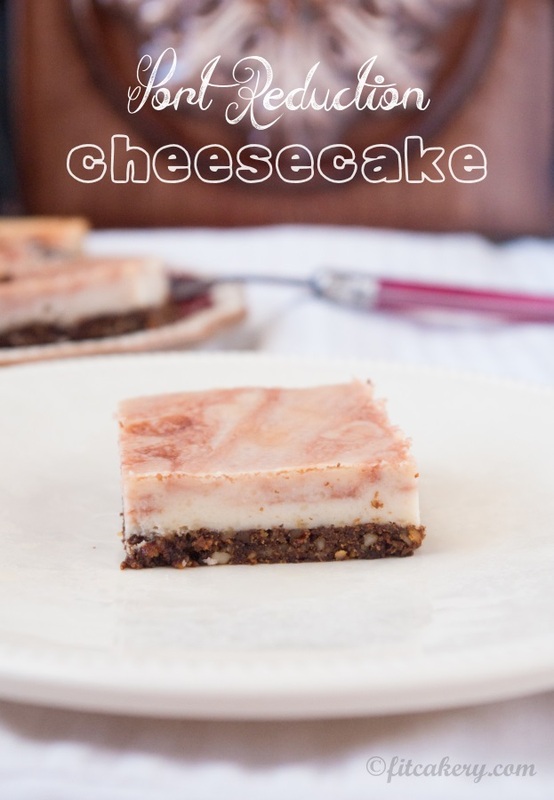 Because anyone could make a port reduction and put it on… fro yo or something… but a cheesecake - now that would make it simply extended-pinky-worthy. But cheesecake bites are even better! Cheesecake bites you can hold betwixt your thumb and index fingers while holding out your pinky and sipping tea or Champagne with the other hand. Doesn’t that just sound mahvelous, dahling? One thing I will say, though, is that even with the vegan cream cheese, my husband (who doesn’t say he likes anything he doesn’t like) said that this cheesecake was the best one I’ve made so far. High praise from a non-vegan dessert-skeptic! Question of the day: What do you like to make for parties, birthdays, etc? Cake? Pie? Cheesecake? Something you made up? 8 oz vegan cream cheese (I used Tofutti) Note: Regular cream cheese works, too! In a food processor, combine cashews through salt until the crust has a uniform crumb (there are no large chunks of anything.) Add the 2 T. port and process. The mixture should just start to cling together when pressed. Spray the bottom of an 8 x 8” or 9” round baking pan coated in baking spray. Press the crust mixture into the bottom of the pan until it is packed down evenly. Bake the crust for about 8 minutes, then remove to cool. Immediately reduce the oven temperature to 350 degrees F.
Meanwhile, in a small sauce pan over medium heat, reduce the ½ c. port for 10 minutes or so, at a simmer, until reduced to about half the volume. It will look a bit syrupy when done. Allow to sit at room temperature while you finish the filling. Blend in the cream cheese through stevia liquid until everything is completely smooth. Pour this on top of the crust. Pour the port reduction on top and use a knife or small spatula to swirl it lightly into the filling. Bake at 350 degrees, about 30-35 minutes. The cheesecake will thicken but still be very moist. Allow to cool to almost room temperature before covering and chilling in the refrigerator. Cut into little squares and serve at your next tea party or fancy soiree! Makes 16 (2”) squares or 36 bite-sized squares.